Coach just shared with me its new advertising campaign titled “COACH PUPS”. How cute?! The new campaign features canine stars in a series of portraits photographed by Steven Meisel. It launches this month with Miss Asia Kinney, the adorable four-legged companion of Lady Gaga. 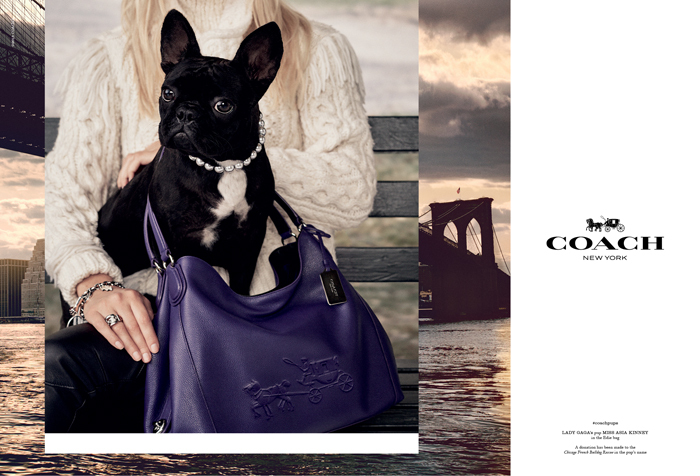 The campaign celebrates the dogs in our lives and captures the pups’ unique personalities as they “model” Coach’s Fall 2015 star bags. Additional PUPS staring in the campaign will be revealed shortly. Miss Asia Kinney, Lady Gaga’s now famous French Bulldog has amassed a substantial social media following in only a few short weeks. The Coach bags she elegantly models in the campaign are the Edie and the Rucksack. This new initiative will introduce the social campaign #coachpups, including a range of online activities for fellow dog fanciers, opportunities for Instameets, special talks and other events hosted by the great and the good of the canine world. This will also mark the debut of the Coach Snapchat account. Coach has also made a donation to Chicago French Bulldog Rescue (frenchieporvous.org) on behalf of Miss Asia Kinney and her devoted owner. I look forward to seeing the full Coach Fall 2015 collection with the rest of its predictably adorable furry stars!